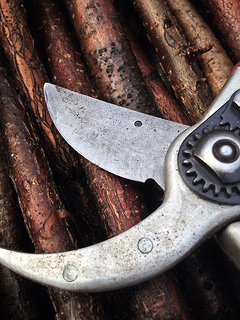 One of the things I had never done was to sharpen a pair of secateurs, so when a colleague said he was going to fix his and offered me to tag along I took the opportunity straight away. After disassembling the nuts, bolts and the spring, we cleaned and sharpened the blade using oil and stone, then had to reassemble the lot. I look forward to doing it again to see if I can remember how to do it properly as I was shown... and in the meantime I will keep the official instruction for maintenance to hand. After that, I spent the day finishing the jobs I started yesterday, and reflected on the past week. As the distances in the garden are considerable, it is best to carry all the tools you think you will need with you from the start of the day, so as to avoid having to go back to the toolshed. As my garden and plot are fairly small, I can access whatever I need at all time, but this new experience is a good exercise in planning your day ahead and general efficiency. Because we work in contact with the public, we need to be particularly careful with health & safety, avoiding that our tools get in the way or endanger anyone, and we have to leave everything neat and tidy. That is also a good exercise for me, so I am getting used to planning my gardening tasks more carefully, finishing what I have started and leaving time to clear up. Last but not least, I have started working in a team: I depend on others and others depend on me - although I have worked in teams in an office all my life and I'm well acquainted with the principles, it is a new way of gardening for me, and out there in the open, doing physical work, being able to rely on a team feels more... essential.